Chrysopelea are most commonly known as the flying snake, or gliding snake. They are a genus of the family Colubridae, the largest snake family to 51% of all known living snakes. There are 5 species of flying snake, which inhabit jungles, forests and woodlands of South and Southeast Asia. Location: South & Southeast Asia. Color: Mostly green, but dependent on species, with black, red and yellow. Diet: Lizards, birds, bats, rodents, frogs. The 5 species of flying snakes can be found in Vietnam, Cambodia, Laos, Greater and Lesser Sundas, Maluku, the Philippines as well as in parts of China, India and Sri Lanka. Chrysopelea are diurnal, which means they are day hunters. They are meat eating snakes, and will hunt lizards, birds, bats, frogs, and rodents. There is not a lot known about these creatures in the wild, but it is believed that they rarely leave the tree canopy they inhabit. This means that you won’t likely encounter one on the ground. They range in size depending on the species. The smallest is about 2-feet in length with the largest reaching about 4-feet in length. Although these snakes are venomous, they have tiny, fixed rear fangs that make them harmless to humans. 1. The flying snake doesn’t really fly, but it does glide. By using ridge scales located along its belly, this snake can climb vertically up a tree by pushing those ridges into tree bark. When one reaches the end of a branch, it will dangle itself into a J-shape bend. As it leans forward to choose a landing spot, the snake essentially flings itself off by thrusting its body up and off of the branch. While sailing through the air, the snake flattens it’s body to help glide, and moves in a serpentine motion to control direction and landing. 2. 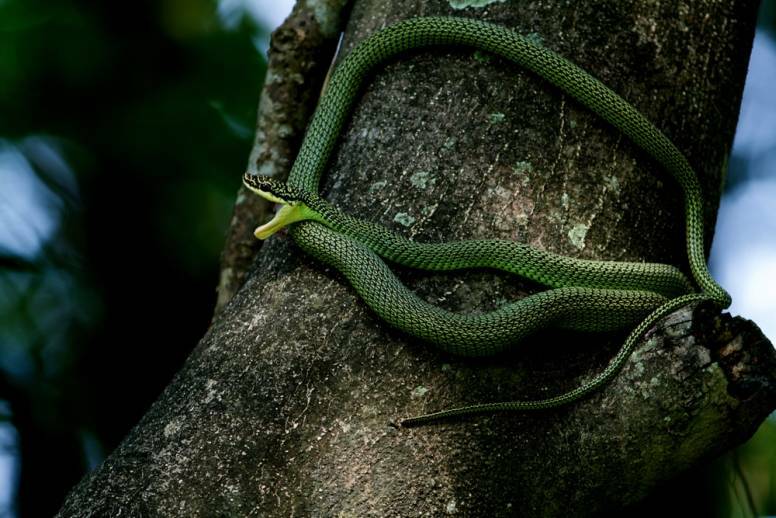 Flying snakes jump from tree to tree to hunt, and keep away from predators. As flying snakes hunt during the day, it is believed that they will fly from the top of one tree to a lower level of another one to hunt their prey. In addition to saving energy compared to ground travel, the gliding from tree to tree keeps the flying snake away from ground predators. 3. Flying snakes are better gliders than many other ‘flying’ animals. 4. Flying snakes are capable of traveling more than 100-metres in a single glide. They can travel great distances in the air despite not having wings. 5. Flying snakes have an internal guidance system. Although ballistics has a great deal to do with the selection of destination, thanks to being able to slither in mid-air, flying snakes can control some of the in-air attitude. 6. Smaller snakes fly further. Studies conducted by the University of Chicago revealed that there is a negative correlation between snake size and gliding ability. Apparently, the smaller the snake, the further it could travel horizontally. 7. Science may use flying snake gliding principles in robotics. The on-going research into how flying snakes maneuver in mid-air is expected to lead to technology that can produce robots designed to glide in the air from one location to another. 8. The largest flying snake species is not a very good glider. The Golden Tree Snake, also known as the Ornate Flying Snake, can grow to the length of 4-feet. As a result of its size, and weight, its gliding ability is weak. 9. One species of flying snake makes a pretty good pet. The Paradise Tree Snake grows to about 3-feet in length. It is known to be popular in the pet trade in Europe and oddly enough, this particular species is the best glider of the bunch. 10. The smallest flying snake has another interesting distinction. The Twin-Barred Tree Snake – also known as the Banded Flying Snake – is the smallest species of these snakes. They can grow to about 2-feet in length and are considered the rarest of the Flying Snakes. 11. Very little is known about two species of flying snakes. The Moluccan Flying Snake and Sri Lankan Flying Snake are two unusual species of flying snakes. The former is native to Indonesia, while the latter is native to Sri Lanka. Not much else is known about them. 12. Flying snakes use their tail as landing gear. If they have enough space and they land on the ground, flying snakes appear to drop their tail down first, almost like their landing gear to soften and control their landing. 13. The glide of a flying snake is very fast. The measured speed of the average flying snake in mid-air ranges from 8 to 10-metres per second. 14. They can only glide in one specific direction. Flying snakes do not ‘fly’ upwards in any way. As gliders, and thanks to the forces of gravity, the trip taken in the air is usually to a spot down below the launch point. 15. The flying snake uses its head in flight. Rather than thinking about the landing, the flying snake will rock its head back and forth which causes the rest of its body to undulate and thus gain control if the flight. 16. Flying snakes are colourful. Depending on the species, flying snakes are green, black or dark grey in color. Some have yellow scales, orange or red markings and black bars. 17. The flying snake is very different to many of its distant relatives. One word is often used to describe the flying snake. It is ‘slender’ and compared to most other snakes, this is very true. The slender body contributes to the snake’s gliding ability. 18. The flying snake looks pretty much like any other snake. Just from its appearance you would not know a flying snake from another different snake, as there are no appendages or other features that are common with creatures that have the ability to ‘fly’. “A 3-D kinematic analysis of gliding in a flying snake, Chrysopelea paradisi.” (2005), via NCBI. “Secrets of flying snakes revealed”, (2014) via BBC News.